We're having hash for dinner tonight. The detective had to sift through a hash of information in his attempts to solve the crime. The author's book was a hash of various articles she had written and conference papers she had given over the previous year. Rob is busy hashing the meat for tonight's meal. We spent the afternoon hashing over our plans for the following week. The actor hashed his lines. Hash is also an abbreviation for hashish, an Arabic word for cannabis. Hash is also this sign on your keyboard #. On your phone it is called the hash key (UK) or pound key (US) and sometimes you might be asked to press it when speaking to an automated service. Most commonly now, of course, it is used in reference to Twitter, and more generally about things that are trending on social media, as part of the word hashtag, so called because the trending item is being tagged with a hash sign. 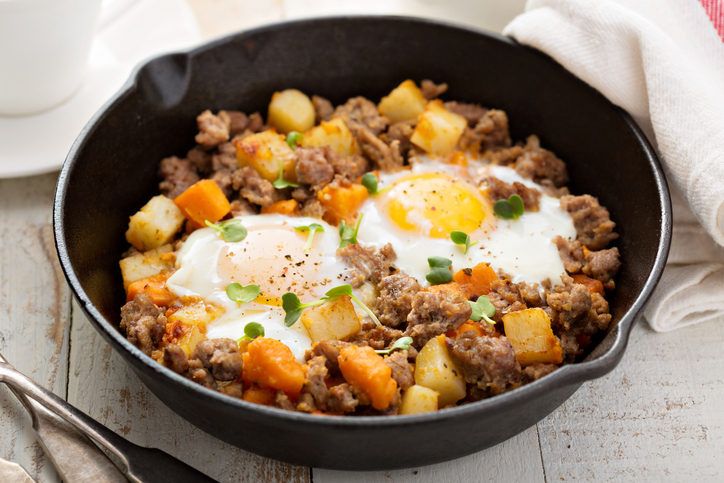 Hash, meaning ‘to cut up into small pieces,’ dates back to the mid-17th century, and comes from the French hacher (to cut up), which originated in the Old French hache, meaning ‘ax or hatchet.’ The noun meaning ‘a stew of meat cut into small pieces,’ also dates back to the mid-17th century, and comes from the verb, though if we look back to the French origins, the verb comes from the noun! The noun meaning ‘a mix or mess’ dates back to the mid-18th century, and the related verb sense came from this noun meaning in the late 18th century. Hash browns is a shortened form of hashed browned potatoes, so the name comes from the verb, though the -ed was dropped (the same can be said for mash(ed) potatoes, or just mash). Hash also had a specific meaning in military slang in the 20th century, when a soldier’s hash marks were the stripes on his or her uniform. They were called hash marks because they stood for the number of years a soldier had been in service—in other words, when he had received free food or hash. This meaning was taken up by football slang; the white marks on the field can be called hash marks because they look like military stripes. The meaning later expanded to other white stripes, including the hash key on the phone (the first phones had black keys with white numbers).